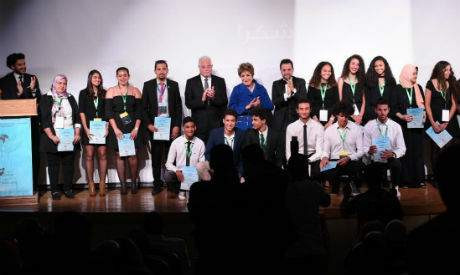 The fourth Sharm El-Sheikh Youth Festival closed on Sunday, concluding another successful round. The closing ceremony was capped with a performance by the Youth and Sports Orchestra, led by Maestro Ezz El-Din Taha. This edition was dedicated to Egyptian comedy actor George Sidhom, and took place from 1 to 7 April, with 15 plays from 11 countries participating in competition. The Samiha Ayoub Prize for best performance went to the Canadian play Last 15 Minutes. The Mohamed Sobhi Prize for best directing went to Kuwaiti director Youssef El-Hashash for the play Wahsh Torous, which also picked up the Best Scenography prize. The Mohamed Henedy prize for best actor went to Bahraini actor Aqil Ali Ahmed for his role in the play XO. The Amal Dabbas prize for best actress went to Egyptian actress Rana Khattab for her role in Drama ElShehathin. The prize for street theatre was split between Iraqi play Helm (Dream), and Sada (Rust) from the United Arab Emirates.